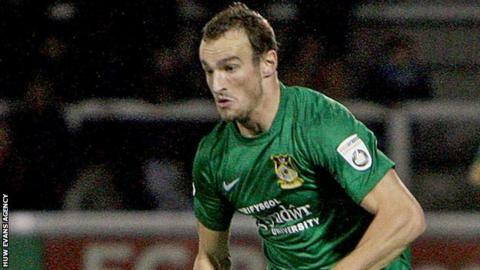 Wes York, James Gray and Dominic Vose's late penalty gave Wrexham a comfortable win over winless Aldershot at The Racecourse Ground. York guided Connor Jennings' cross into the back of the net to take the lead. Gray nodded in the second after Manny Smith's headed pass. And Vose underlined Gary Mills' side's superiority from the spot after Luke Oliver's goalmouth foul, giving them a second win from three in the National League. Wrexham manager Gary Mills told BBC Radio Wales: "It was an unbelievable performance. "And it was an improvement on Tuesday [beating Torquay 3-1] and we've got to go and improve on that on Tuesday, or emulate it certainly. "I'm so pleased for everybody. With and without the ball I though we were excellent." Aldershot Town boss Barry Smith told BBC Surrey: "Credit to Wrexham, I thought they were very good today and they were better than us. "Players have got responsibilities and we know we have to mark and defend better. If they switch off for a split second, that's what causes a goal and that can't happen. "They had a lot of possession without really doing much with it. But after they scored, you are always chasing the game and it becomes more open. They have good quality players and they deserved their win. Match ends, Wrexham 3, Aldershot Town 0. Second Half ends, Wrexham 3, Aldershot Town 0. Foul by Omar Beckles (Aldershot Town). Goal! Wrexham 3, Aldershot Town 0. Dominic Vose (Wrexham) converts the penalty with a right footed shot to the bottom right corner. Luke Oliver (Aldershot Town) is shown the yellow card for a bad foul. Penalty conceded by Luke Oliver (Aldershot Town) after a foul in the penalty area. Penalty Wrexham. Kayden Jackson draws a foul in the penalty area. Substitution, Wrexham. Kayden Jackson replaces Wes York. Foul by Nick Wilmer-Anderton (Aldershot Town). Wes York (Wrexham) wins a free kick. Foul by Richard Brodie (Aldershot Town). Jamal Fyfield (Wrexham) wins a free kick. Attempt saved. Wes York (Wrexham) right footed shot from outside the box is saved. Substitution, Wrexham. Adam Smith replaces James Gray. Foul by Jamal Fyfield (Wrexham). Charlie Walker (Aldershot Town) wins a free kick. Offside, Wrexham. James Gray tries a through ball, but James Gray is caught offside. Foul by Luke Oliver (Aldershot Town). James Gray (Wrexham) wins a free kick. Attempt missed. Jim Stevenson (Aldershot Town) header from the right side of the box misses to the right. Assisted by Tom Richards. Substitution, Aldershot Town. Charlie Walker replaces Rhys Browne. Attempt missed. Connor Jennings (Wrexham) right footed shot from outside the box is too high. Attempt saved. Wes York (Wrexham) right footed shot from the right side of the box is saved. Attempt missed. Rob Evans (Wrexham) right footed shot from outside the box is too high. Foul by Rhys Browne (Aldershot Town). Attempt saved. Jim Stevenson (Aldershot Town) right footed shot from outside the box is saved. Substitution, Aldershot Town. Richard Brodie replaces Matthew Barnes-Homer. Substitution, Aldershot Town. Tom Richards replaces Jake Gallagher. Nick Wilmer-Anderton (Aldershot Town) is shown the yellow card for a bad foul. Goal! Wrexham 2, Aldershot Town 0. James Gray (Wrexham) header from the left side of the box to the bottom left corner. Assisted by Manny Smith with a headed pass.